Sandwich City Hall is located at 144 East Railroad Street, Sandwich, IL 60548; phone: 815-786-9321. Photo: von KleinSmid Mansion, ca. 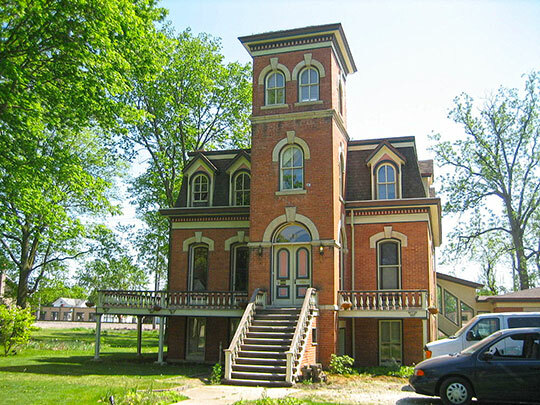 1865, 218 West Center Street, Sandwich, IL. Listed on the National Register of Historic Places in 1985. Photographed by User:A. McMurray (own work), 2007, [cc-by-3.0 (creativecommons.org/licenses/by/3.0)], via Wikimedia Commons, accessed July, 2014. The City of Sandwich is located in Sandwich Township in DeKalb County and extends past the county line into Kendall County. The southern boundary of the city is located on the line of LaSalle County. In 1834, located about three miles north of Sandwich a mail route was established. Three years later the post office was moved to a location on Somonauk Creek (location of the current Sportsmen's Club). At that time the post office was known as the Somonauk Post Office. In 1851 the Chicago, Burlington and Quincy (CBQ) Railroad began surveying the railroad and in 1853 the CBQ Railroad had finished construction with a stretch through Sandwich. The plat survey for Sandwich was completed in the winter of 1854 and filed in January 1855. At this time the location of the train station had not been determined. People of nearby Newark wanted a station close to their town, along with other people in the vicinity. So, the train company established a flag station where trains would stop if there was a signal. The new city needed a name and the name Almon was proposed on behalf of the owner of the plat, Almon Gage. He declined. The railroad had given the area a name called Newark Station because Newark was the community that wanted the station. The locals went with the name Newark Station until 1856 when John Wentworth, a Congressman for the area, had the name changed to Sandwich for his home town in New Hampshire. Mr. Wentworth was a major influence in getting the station and post office in the area. The Sandwich Post Office was started in 1850. The town of Sandwich was established in 1859 and became a City in 1872, after the Civil War. On April 14, 1861, the Civil War began with the fall of the Fort Sumter. President Abraham Lincoln asked for 75,000 men on the 15th and by the following Monday, Sandwich had 112 volunteers with uniforms that were made by women in Sandwich. The company was assigned to the 10th Regiment Illinois Volunteers Infantry. Throughout the war, 311 men volunteered from Sandwich Township. In 1878, the building housing the Sandwich Opera House and City Hall was constructed. This was a multi-purpose building that included the city offices, fire station and police station. The second floor became the Opera House which held a variety of activities. In 1979, the building was placed on the National Register of Historic Places and work began to restore the historic building. The restoration was completed in 1986. Comprehensive Plan of the City of Sandwich, 2003, www.sandwich.il.us, accessed July, 2014.